Self-discovery is normally one of those excuses or phrases you hear from a teenager as to why they’re spending their parents’ money on a year’s globe-trotting rather than making the jump to university, only for you to discover that, for the most part, they’ve only done it just so they can appear more interesting at parties. It’s not typically a realm that videogames attempt to explore; especially not by those most revered for releasing adventures filled with monkeys, grog and insult sword-fighting. Created by industry legend Ron Gilbert, The Cave sees players choosing between seven protagonists (technically eight, but the twins count as one playable character) to take three of them into the titular Cave – a mysterious and sultry narrator who also pulls double-duties as the location for the ensuing madness. Taking several cues from Gilbert’s seminal effort – Maniac Mansion – each character brings something different to the foray and The Cave demands that you make the most of your intrepid figures in order to spelunk your way to the bottom. Utilising these unique powers becomes the only way for each character to access their own personal space in the Cave; each has a dark desire within them that our silky-voiced narrator is only too happy to oblige with a maniacal chuckle. To see these out, each character needs to work together – whether it be setting up traps to catch monsters or reuniting a prospector with his beloved mine-carts – if they ever want to see their wishes fulfilled. Traversing the depths of the titular Cave is quite simplistic, with all of the controls – jumping, moving and interacting with objects and using special abilities – consigned to only a few buttons. 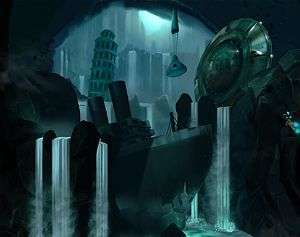 Additionally, all of the platforming sections aren’t a test of your skill, but a way to add depth to the vast expanses of your location; there aren’t any sections that rely on perfect timing to jump between platforms and you’ll be expected to do a lot of climbing about and exploration if you wish to see the other side. When playing solo, this exploration can sometimes feel a bit slow, but this is normally only noticeable if you need to move more than one character to the same location. 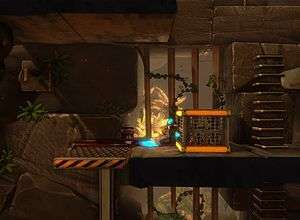 There are several checkpoints where the non-controlled characters will catch up to you, but these are often only at points of no return, rather than during specific puzzles. The addition of a “warp to character” command would have alleviated this problem, but even then I’d only have liked it as a post-completion reward for a new game plus. Finishing The Cave only once feels a bit empty, as doing so means you’ll only have seen about half of what this adventure truly has to offer. While there are areas that you’ll have to proceed through every single time you play, the character-exclusive sections are where this title truly excels. Fulfilling the wishes of each explorer is an absolute joy, and the puzzle design becomes a lot tighter than the more general sections that have to accommodate themselves to be completed with any combination of protagonists. Once you attempt to fulfil these wishes, you’ll soon discover why I’ve not once referred to these band of explorers as ‘heroes’ – their desires make them anything but, and the steps you’ll have to take to succeed only further cements their antagonistic qualities. There’s not a single person who isn’t negatively affected by your actions, whether you play through with the knight, adventurer, time-traveller, hill-billy, scientist, twins or even the monk. What makes these vile actions so powerful is that you’re forced to perform them yourself, but also because – with only one or two exceptions – the way they’re presented means that you’ll gleefully relish the opportunity to do so. The road ahead isn’t full of flowers and cutesy talking bunnies, nor is it paved with gold, but what makes The Cave such a darkly-humorous title is the superb writing coupled with the amazing narration from the titular land-mass. Throughout all of the story’s events, the only people being addressed by the narrator are the players themselves, with the explorers only being spoken to by the various denizens they’ll meet and inevitably screw over on their path to glory. Though these victims have some great lines, it’s the title character himself who has the funniest moments, whether he’s hinting towards the inevitability of your actions, goading you into performing them or taunting you about them afterwards. His near-constant presence keeps you intrigued and will never outstay his welcome throughout the duration of your adventure, easily becoming one of the greatest highlights in a game that has plenty throughout multiple play-throughs. A single journey through The Cave will only take the player about three hours – and my second play-through came in at almost exactly two and a half – yet everything is near-perfectly paced and even after seeing the credits a second time you’ll find yourself itching for another run. Even after you’ve finished the story with every single character, you still haven’t found everything that this title has to offer, and if you truly want to see it all you’ll find yourself making at least five trips. It isn’t just about making it from A to B, as you’ll also want to hunt down the Cave paintings that reveal the back-stories to each of your playable cohorts and decide whether their endings allow them to fulfil their desires and see out the consequences of their actions. Just playing once does both you and the title itself a disservice, as it’s through alternate runs that you’ll notice and cherish the little touches that make The Cave such a wonder to explore. Depending on your combination of characters and your actions, you could easily miss delights like the hall of uniquely-titled flames, have a late-game puzzle act as a call-back, and discover hints as to what really happened to your previous explorers. Even sections you’ve played before can play out differently if you have a different squad with you and can utilise their unique powers to streamline the puzzle-solving. The puzzles themselves are often excellent, with the only real complaint being that solo traversal can feel a little slow as you figure out what to do, as well as the fact that there’s the occasional puzzle where a third player feels more like just an extra step in the puzzle rather than an organic part of the solution. These moments are few in number, but may come across as unideal to confront when engaging in an additional play-through although, as previously mentioned, this is occasionally alleviated if you happen to have the right combination of characters to bypass a step or two. Spelunking to the bottom can often feel like quite a lonely affair if you’re not playing with friends, and this feeling is brought home by the incredibly-minimalistic music, which was so minimal that its inclusion can add an extra dimension to the proceedings, even if none of the tunes are particularly memorable. What will stick in your mind long after playing are the excellent art-styles present in both the game itself and the Cave paintings you’ll unlock as you explore its hidden depths – the former a beautifully pseudo-realistic cartoon style that brings even the dankest sections to life and the latter Psychonauts-reminiscent images that you’ll be dying to print out and stick on your wall. Once you finally find yourself done with The Cave, you’ll find it hard to pinpoint any particular flaws outside of the occasional moment where you’re forced to back-track, the rare moment where your movement feels a little slower than it could be or having to move all three characters to the same area to solve a puzzle, and even then these are only issues that manifest after playing several times. This title is one that’s a joy to play, and while it’s not as funny as Gilbert’s greatest, it’ll make you think a lot more thanks to compelling writing that joins in on the recent trend of making the player reflect on their actions and the way they interact with a story. It’s not the longest title around and players may be put off by how many times they have to play through to truly appreciate everything it does, but if you’re in the mood for something unique, hilarious and self-reflective, you can’t go wrong with The Cave. Character-exclusive sections are wildly varied and inventive. Full of brilliant touches and memorable moments. Beautiful and varied art-styles that bring the world to life. Excellent puzzle and world design that offers plenty to explore and uncover. Have to play through about five times to see everything. Traversing and back-tracking can feel slightly slow when playing alone. Although it's not Gilbert's finest game, it's one that will make you laugh often and does an amazing job of examining the role of the player and their involvement within a game's story. While a single play-through may only set you back a handful of hours, there's plenty to keep you coming back for more. There's so much encased within such a deceptively small title, and it's an absolute joy to explore and uncover the myriad of secrets encased within. It's a deceptively-fun romp that isn't the best adventure game you'll ever play - and requires at least two play-throughs to truly enjoy - but it's one that'll hopefully stick with you long after the credits roll.